With Venus in the eighth house, you take love and commitment very seriously. You are a deeply emotional and intense person, and you need an incredible amount of stimulation to keep you coming back for more. So when you find it in someone, you don’t want to let them go. Venus symbolizes love, sensuality, an alluring personality, beauty and aesthetics. 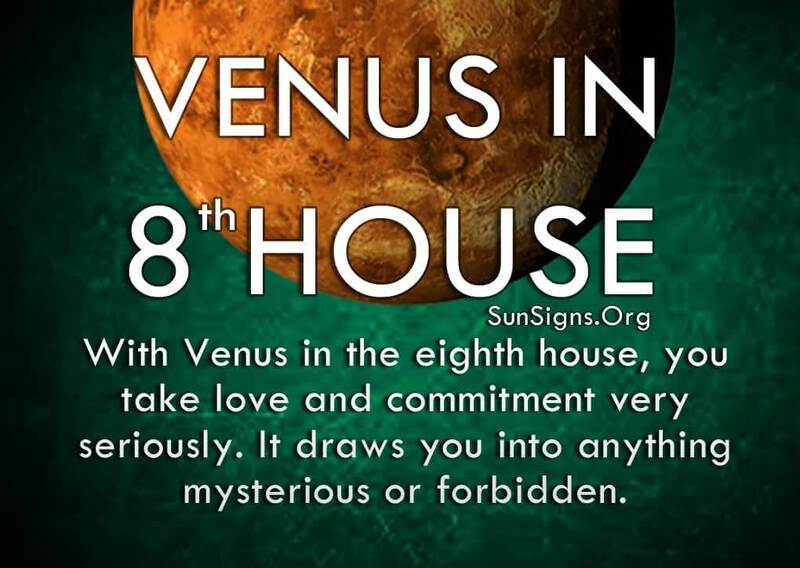 For the 8th house, Venus draws you into anything mysterious or forbidden and makes you want to see more and know more. See more Venus meanings here. This is true of people as well, because you aren’t one for casual hookups. You get to know someone completely before committing to them. And this isn’t difficult for you to do, because your incredible intuition allows you to read anyone like a book. Venus in 8th house meaning shows that while you keep your thoughts and feelings hidden deep within, other people are as transparent to you as glass. This is very important to you, for you need to be with someone genuine who hates superficial things and people as much as you do. You want passion and raw emotion and real conflict that involves a dramatic resolution, or else what’s the point of living? This is natural as Scorpio is your ruling zodiac sign with Mars as the ruling planet. Venus in 8th house astrology predictions show that intensity of all kinds fuel your wants and desires, but it can hinder your search for a healthy relationship. Not everyone is as obsessed as you are with finding truth in love and lust. Your need for everything to have some hidden meaning can be overbearing and exhausting after a while, and not everyone can keep up with you. Sometimes your passion can get the better of you, while others just want to relax and have a good time. You need to slow down every now and then and realize that some things are fine the way they are, on the surface and underneath. It doesn’t always have to be one way or the other. Sometimes the grey area is just that, with no mystery to solve. Just because you throw your heart and soul into everything you do doesn’t mean other people aren’t doing the same thing in their own way. This feeling of anxiety that those closest to you will betray you in some way prevents you from creating solid and satisfying relationships. Venus in 8th house people have to learn to trust people, and not always expect the worst. If you do, it can become a self-fulfilling prophecy. Be careful that you don’t become your own worst enemy and scare people away with your intense nature. Your mysterious facade attracts some but frightens others. There are those who love a good mystery and will try to get close to you, but only so they can figure out what makes you tick for the challenge of it. And then there are people who might be good for you, but because you don’t actively pursue them they don’t think you are interested. Just try to be aware of your jealous nature, for that can sabotage you too early in the relationship. Because you go all in, you expect others to do the same. And while they think they are showing their devotion, your possessive attitude kicks into overdrive and you accuse them of betraying you. Don’t get ahead of yourself, for they have no idea what you’re talking about. Allow them to prove their trustworthiness and they will.